Why were more than 65% of pages related to overseas investments? Why did he have investments in a Chinese oil company? Why did he have dozens of foreign accounts and million stashed away in tax havens like the Caymans? Obama’s people are sure to make many, many similar questions in the coming weeks. 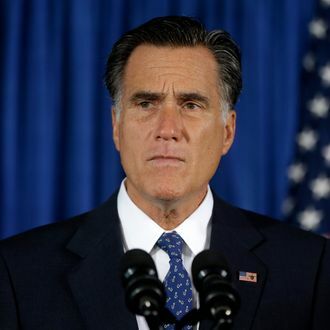 Our main question is: Why would Romney invite renewed interest in his tax returns — and his continued refusal to actually make them public — when the issue had largely faded from the headlines? It certainly doesn’t seem like a great way to distract people from his leaked observations about what 47 percent of Americans pay (or, in his view, don’t pay) in taxes, though it’s one possible explanation. After all, as Politico notes, “Providing information about his own tax rate seems geared toward eliminating the question about whether he himself has at any point not paid taxes.” Still, that’s not much of a gain — Reid is probably the only person in the world who still really believes that Romney managed to avoid paying taxes entirely — and the candidate’s effective tax rate of 14.1 percent will strike most people as low with or without the details provided in the summary.